Closely related to Andalusians, the Lusitano horse is named after the ancient roman name of the territory that is now Portugal. They are also commonly known as Portuguese, Peninsular, Betico-Lusitano, or National horses. Together with Andalusians, they are collectively called Iberian horses. They are warm blooded and intelligent equines that perform well in dressage, riding, jumping, athletics, and work. With evidence showing maternal lineages in the Iberian Peninsula as early as 20,000 BC, the Lusitano breed has a stormy history. Legends thousands of years old tell the story of horses so swift they must have been sired by the wind, and it is believed the strong connection between man and his Iberian horse was the inspiration for Centaurs. The Iberian breed kept its purity up until 711 AD when Muslims invaded the peninsula and brought Barb horses. The two breeds were crossed to create a war, dressage, and bull-fighting horse that surpassed old Iberians in performance in resistance. However, it was also used for high-school dressage. This enhanced local breed was called Iberian war horse and was later introduced to the Americas by Conquistadors. In the 16th and 17th century, the Spanish Andalusians and Portugal’s Lusitanos were repeatedly crossed to improve both breeds as they proved themselves useful in battles. Because of the laws that stopped the production of cavalry horses under the reign of Philip III of Portugal, modern Lusitanos are direct descendants of horses that were stolen or smuggled from Spain into Portugal to preserve the breed. Lusitano became an officially distinct breed from Andalusians in 1966 when the Iberian studbook split into Spanish and Portuguese divisions. Its studbook was established a year later. The 20th century was also challenging for Lusitano horses with the African colonies in Portugal started to revolt and economic collapse was closing down on the Iberian country, which led to stud farms closing down and horses being sold to Spain. However, some of the best lines were saved. Today, the official association for breeders, owners or enthusiasts of Andalusian and Lusitano horses is the International Andalusian & Lusitano Horse Association. The Royal family of Portugal founded the Alter Real stud in 1748 for royal use and for the national riding academy. The breed suffered a decline at the beginning of the 19th century when Napoleon invaded the peninsula and introduced Arabian, Spanish-Norman, Hanoverian, and Thoroughbred blood to the Alter Real. The end of Portuguese monarchy threatened Alter Reals with extinction, but the strain was re-established and its stud reopened in 1942 under the Portuguese Ministry of Agriculture. Alter Real horses are still used today by the Portuguese School of Equestrian Art. Lusitanos are easily recognizable by their elevated gaits. They are taller and lighter than your average horse, appearing noble and supple but strong at the same time. Lusitanos have narrow and well-defined heads with moderately convex profiles. Their necks are thick and arched and they have muscular shoulders. A Lusitano horse has a strong, short back, a broad chest, and rounded croups. Its legs are strong and well-built. Like the Andalusian, Lusitano horses have thick and luxurious manes and tails. A Lusitano horse is usually gray, bay, or chestnut, but any solid color is common among registered individuals. The Alter Real stud only breeds bay horses. Height: 15.2 – 15.3 hands, but can surpass 16 hands. Even though many say the two Iberian breeds are genetically identical, physical differences exist: the Lusitano has a slanted croup, lower-set tail, and a typical head profile. Although a Lusitano horse has no known breed-specific health issues, Melanoma is a health risk for horses with a lighter coat color because of their lack of pigmentation. Melanomas are prone to develop in areas where the skin is not protected by hair, particularly around the tail or the muzzle. A Lusitano horse is approachable and easy to connect with due to their higher-than-average intelligence and their rational thinking and behavior. They are generally docile but are considered slightly hotter than their Spanish counterparts – trait that ultimately leads to fast learning processes during dressage or training. Although the breed changed over time, their legendary swiftness and agility have been preserved. They grow fond of their owners quickly and are always willing to please, qualities that also date back thousands of years ago. A Lusitano horse is generally resistant to environmental factors from warm climates such as the Iberian Peninsula. However, they are sensitive to extremely cold weather and need warm shelters during the winter. A trailer costs between $1,000 and $50,000. Tack starts at $600 and can reach $6,000. Vet check is no more than $550. Grooming supplies can cost $100 at most. Boarding can range between $2,000 and $9,600. Training costs between $200 and $10,200 – for advanced gaits and movements. Feeding a Lusitano can cost between $1,000 and $3,400. Pasture maintenance starts at $200 for owned land and can reach up to $3,600 for rented pastures depending on the area. If the horse is healthy, these do not vary much from area to area and cannot exceed $3,000. They have been included in the initial yearly calculations. A Lusitano horse is a majestic appearance at shows, events, or in competitions. They have naturally elegant movements which ease the dressage and training processes. Pirouettes, piaffes, or passages are undemanding for a trained Lusitano horse. 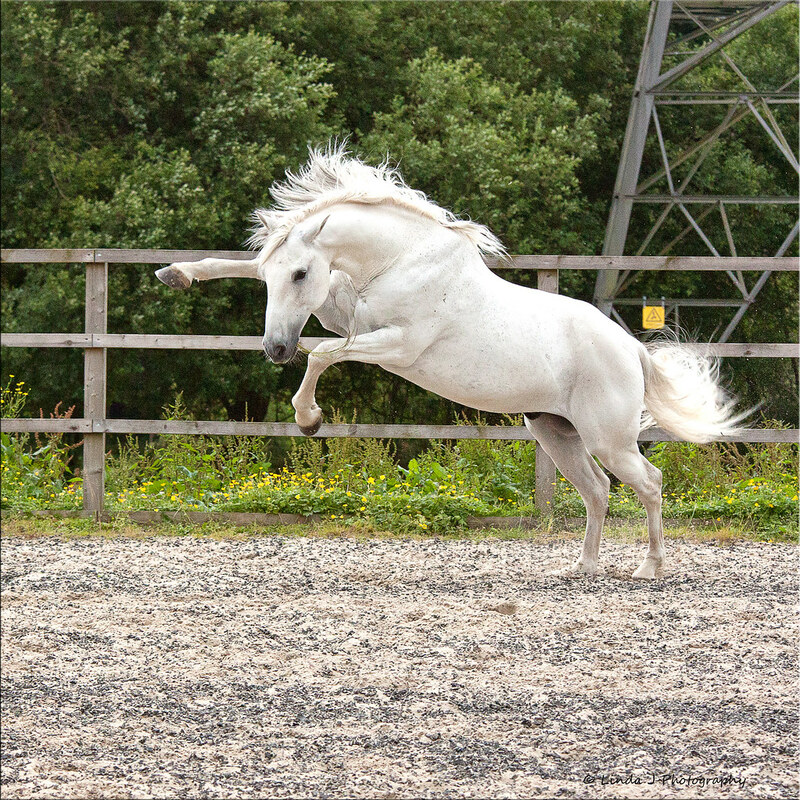 a Lusitano’s typical elevated gait contributes to its majestic appearance. Lusitanos are multi-talented equines and are used today for dressage, endurance riding, general riding, jumping, mounted athletics, racing, or work. Given their sure-footed and agile movements, they are used by Rejoneadors for bullfighting. The Lusitano horse is a sublime equine that, despite its stormy past, aged extremely well. Its dexterous and graceful way of carrying itself is proof they were meant for royalty and luxury.